It’s true. Life can get too busy. Between your career, maintaining an at least functioning social life, cooking meals, doing your laundry, catching up on your reading list, keeping up with the Kardashians, etc., it can be quite easy to be so wrapped up in all this that we lose touch with some of the people in our lives. And if you’ve been an adult for quite some time, you probably already know that you no longer have the time or the energy for arbitrary meetings and whimsical nights out. Thank goodness for reunions! 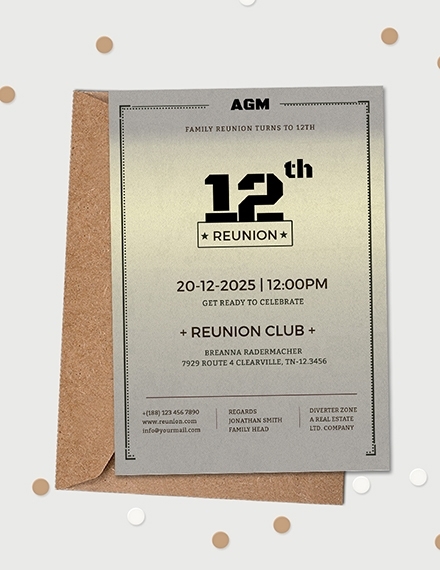 Check out the reunion invitation templates and examples we have provided below to get started. 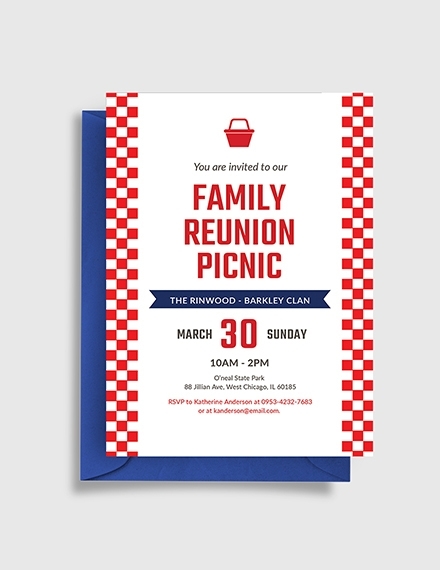 Understand what elements make up a great reunion invitation so you can apply them to your design. Invitational (requests the pleasure of your company, cordially invites you to). 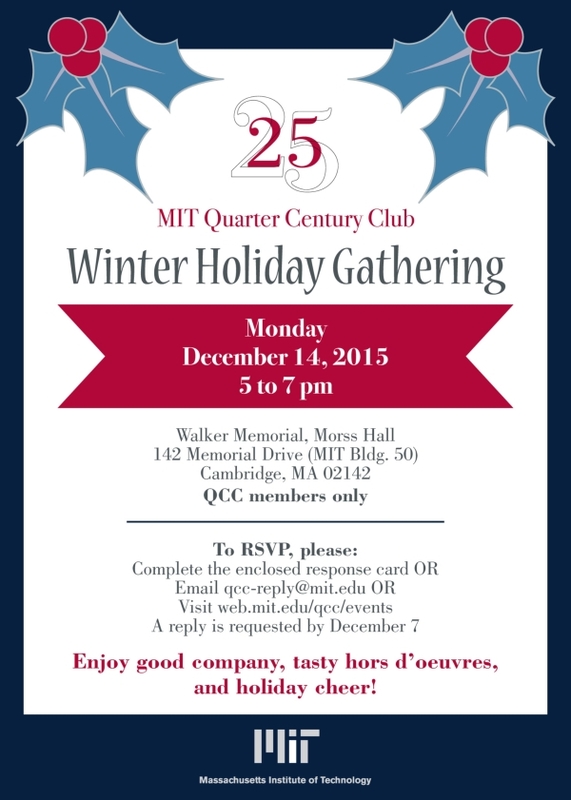 The name of your event and the purpose, which, in this case, is a reunion. Another underlined blank space for the guest’s telephone number or email. Special instructions, such as the reply date or inquiry telephone number. 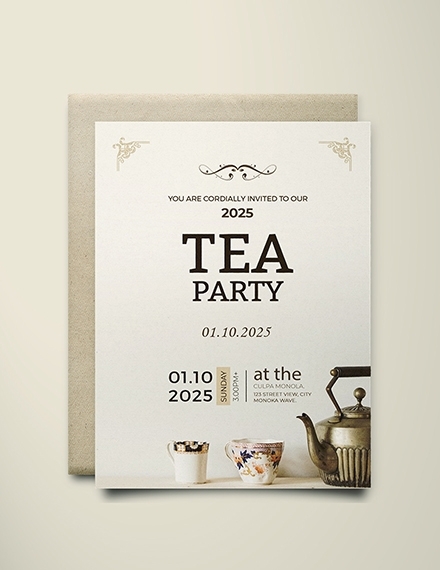 High Tea Party Reunion Invitation. 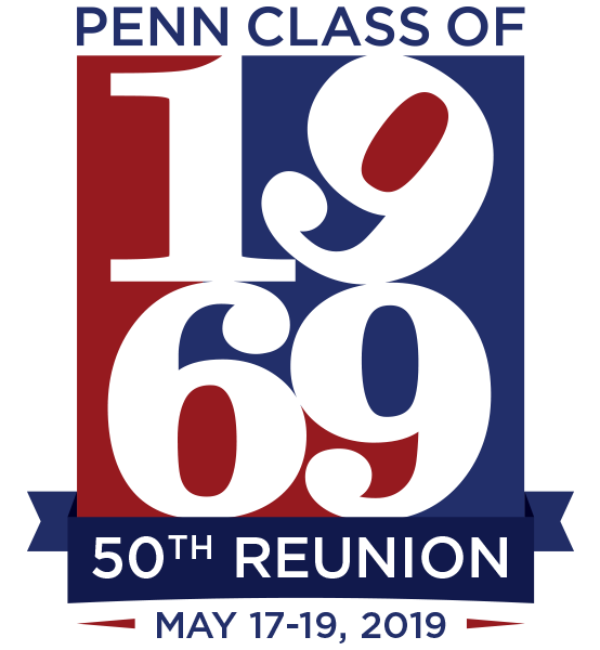 Penn State University School Reunion. Choose the right stock: With invitations, one of the best ways to utilize this additional impact is to select a great stock for your project. For example, if you are going for an elegant formal look, a Classic Crest Duplex 120# Cover is perfect for you. There are so many specialty stocks to choose from. They range from vibrant colors to embossed or textured stocks. 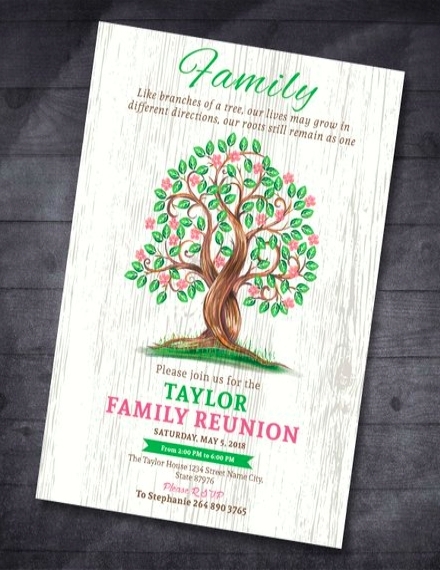 When you are printing your invitations, ask your printer for a stock sample book so you can check out your options. 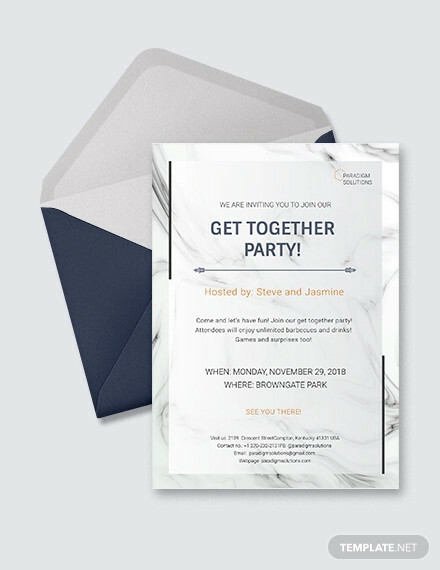 Design an envelope: You can go all-out on your invitation but it will still look humdrum if it doesn’t come with a matching envelope. 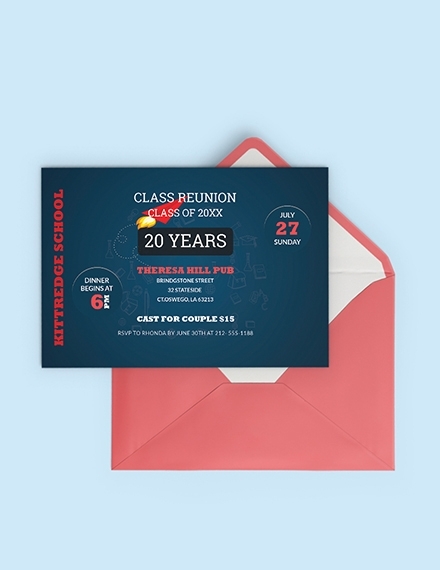 High-technology printing available nowadays can add messaging or designs to your envelope. This can make your envelope stand out against the rest of the mail. Choose the right font: The font is one of the most important aspects of your invitation’s layout. It can make the difference between your message being legible or ambiguous. 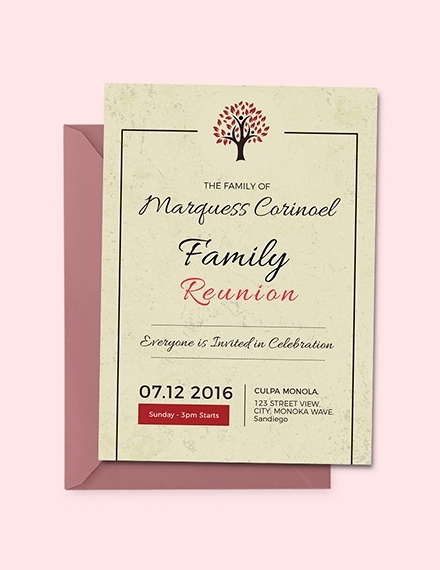 Your font should be timeless while also complementing the overall look that you are trying to achieve for your invitation. 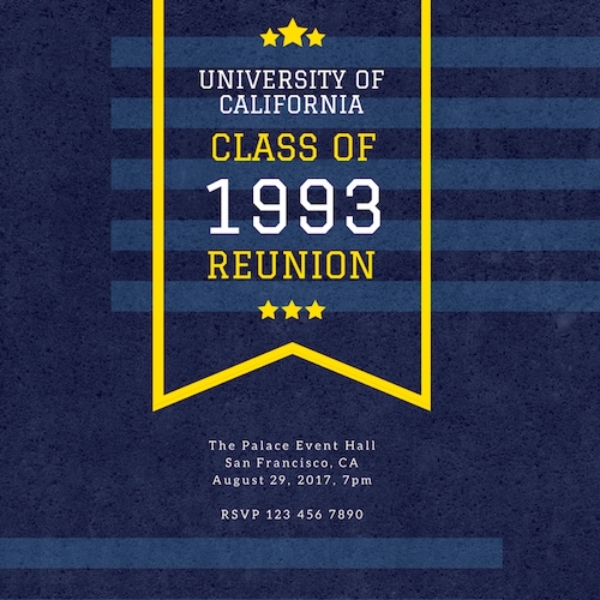 Never forget that a strong typography contributes to the mood and design of your invites. Pick your invitation’s size and shape: Invitations can come in many sizes and shapes. You can experiment with them as much as you want. 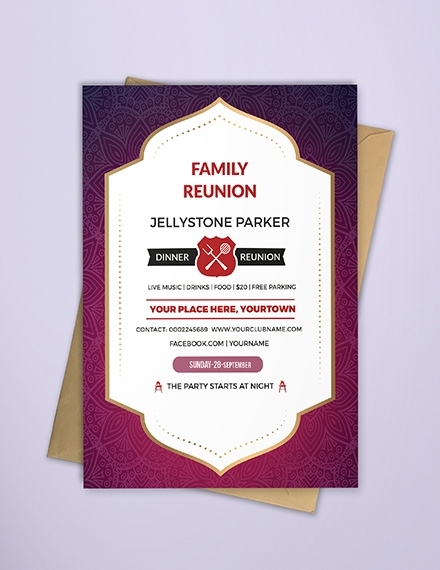 Of course, you can also follow the standard shape and size for invitations, but since this is your event, this means you can do whatever works for you. 1. Pick a visual theme: This reunion is not going to happen every day, so try to put a little more effort into every detail of the event. This includes your invitation. Start with a visual theme that fits your event. Use colors and imagery that are customary for the whole group. 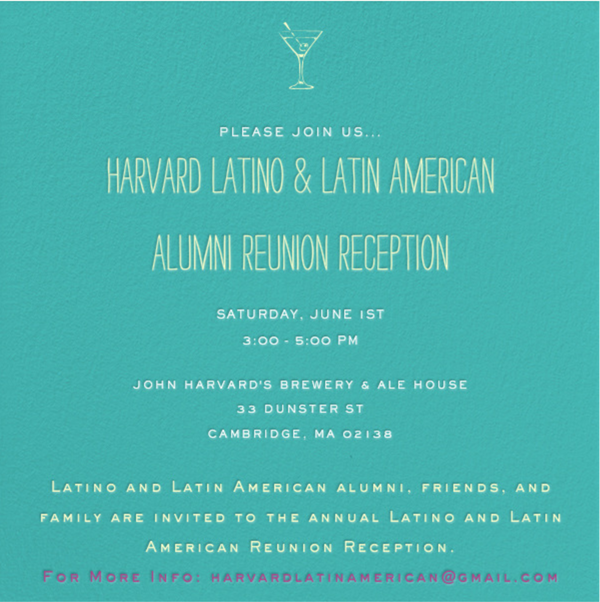 If this is a class reunion, your school colors would be perfect. If there’s a color scheme for the ceremony, start with that. Any detail you can take about the location, number of guests, and how formal or informal the event is can help you get a feel on where to begin. What is the theme or attire? Where can I find more information or RSVP? 3. Link to your website: With the helpful presence of social media and the Internet, you can now create a website or use a hashtag to help engage your guests with the big day. 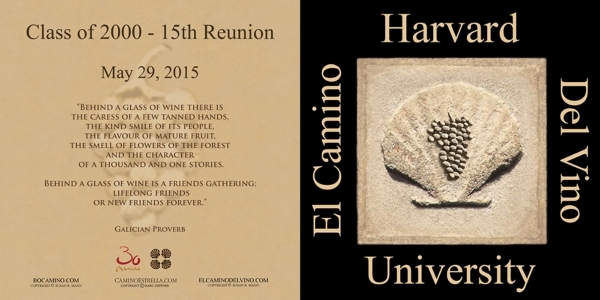 For class reunions, schools often have alumni websites put up, which you can collaborate with. 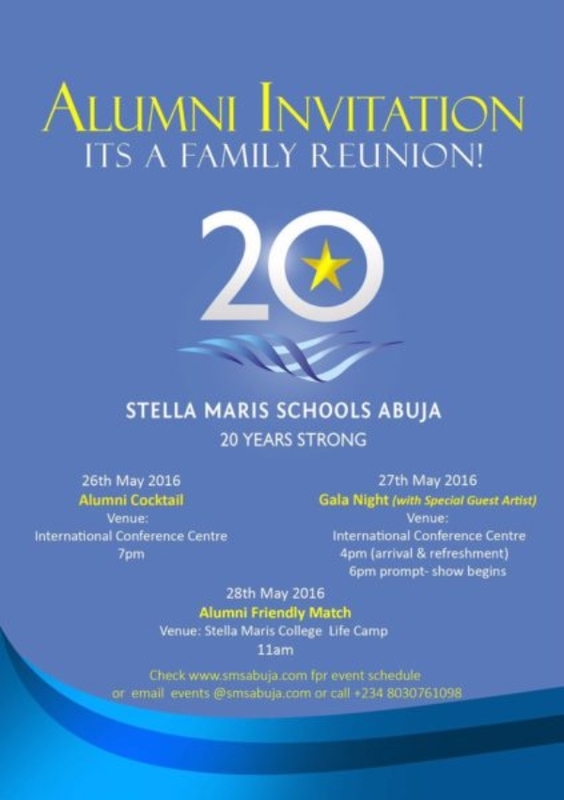 A website may seem unnecessary but it can help guide everyone on how they can be an active part of the reunion. You can encourage them to click on a photo gallery or share photos they have with the whole gang. This can also connect friends who have lost contact over time. These small details can make everyone feel more involved, which is important since this is everyone’s big day, after all. 4. 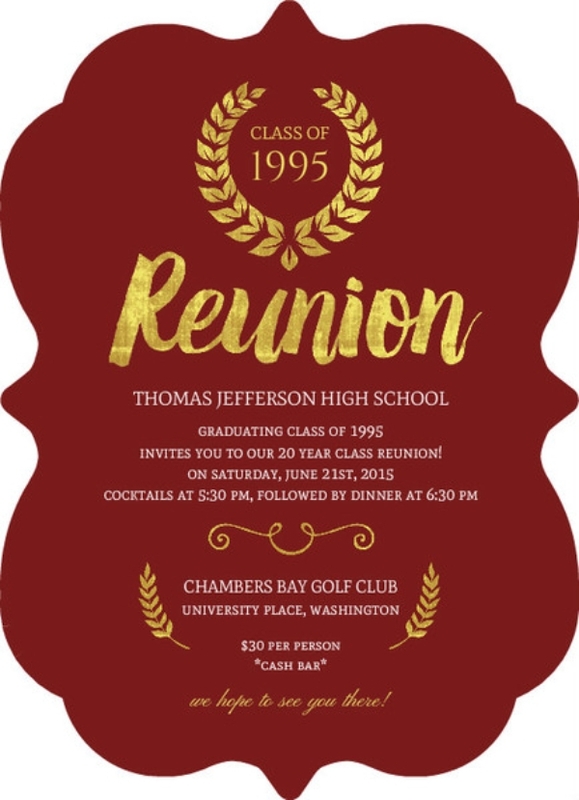 Customize a template: Starting with a pre-made reunion invitation design template, like the amazing examples we’ve provided above, can be a great way to get the design moving and give you an idea on what style fits the event best. A template can also jump-start this type of project for designers that aren’t as accustomed to working on print design projects since templates will come in standard sizes and include elements such as CMYK color and bleed lines for better printing. 5. 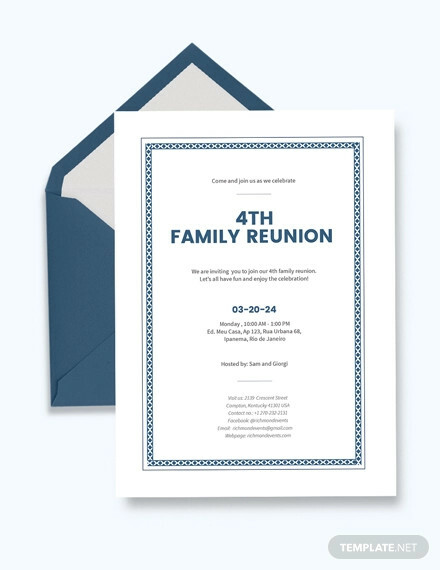 Upgrade with fancy finishes: When designing for print, particularly an invitation, finishes can make all the difference. Incorporate an element such as foil, UV coating, embossing, or letterpress to make the invitation stand out. 6. Make it a photo keepsake: The sad thing about designing a card or invitation is that you know the recipient will open it, take a look at it, and probably throw it away. 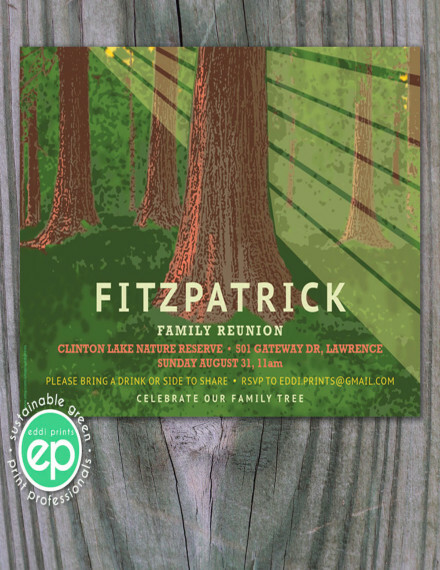 Make the design have a little more lasting power with a reunion invitation that doubles as a beautiful photo keepsake. An awesome class picture from the school yearbook is a great choice. A family picture from the last family reunion or several separate family photos of the family members is never unwelcome either. Belly Band: A decorative element that wraps around your invitation suite to hold all the cards together. This can be made of fabric, paper, ribbon, or embellishments. 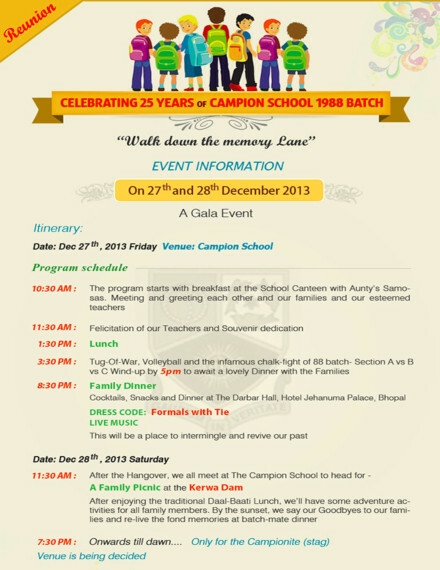 This type of invitation is perfect if yours consists of more than one page. Debossed and Embossed: This one is naturally elegant and sophisticated. 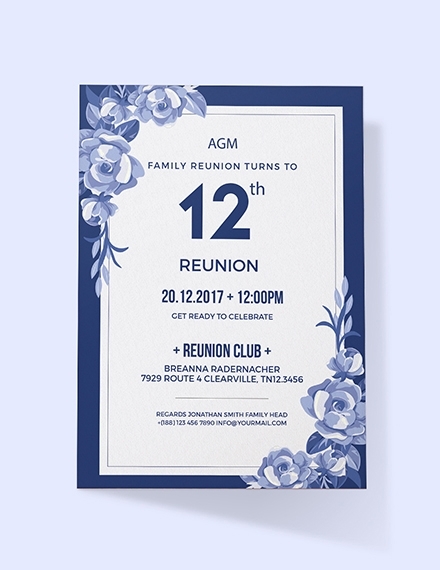 Debossing on invitations is when a design or element is pressed into the paper, while embossing is raising a design or element on the paper using two plates. Engraving: Another type of invitation that screams classic style. Although this process is time-consuming and expensive, the results are so spectacular you won’t mind doing it again. The text is etched or engraved on to a plate that is then filled with ink and transferred on to paper. Foiled: If you want to add bling to your invitations, foil stamping is key. This technique requires a design to be made into a metal plate, that then presses and transfers metallic foils on to paper. Still elegant and less expensive than engraving. Laser Cut: Laser cutting paper is a cost-effective and simple way to add unique and custom design elements to your invitations. Using laser cutting means that you can incorporate intricate patterns like lace into your stationery. This one is perfect for pocketed invitations. Choosing the right size for your invitation can be difficult, so read this short guide on the different invitation sizes for flat and folded invitations. 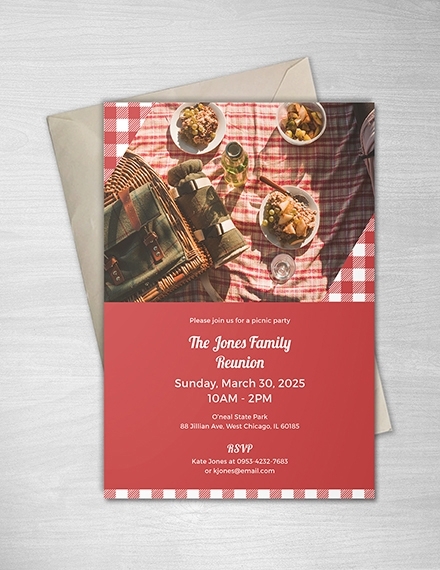 3.5 inches × 5 inches: This invitation size is usually used as a reply to RSVP cards. It is usually paired with another bigger-sized invitation. 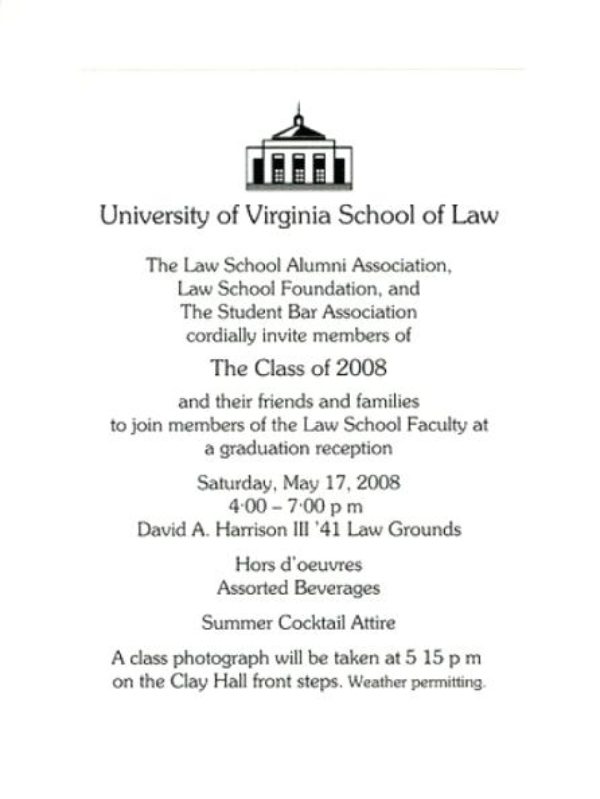 4.6 inches & 4.25 × 6 inches: Regular-sized invitations common for birthdays, christenings, and graduation parties. 5 inches × 7 inches: This size is often used for momentous events such as weddings, achievement awards, and formal functions. How many of your college buddies have you not seen since graduation, and how many of your cousins have you not seen since you were 8 years old? A reunion will give you an opportunity to see these people again, and to share and bond with them for a day filled with activities meant for all of you. Don’t let life stand in the way of your relationships. 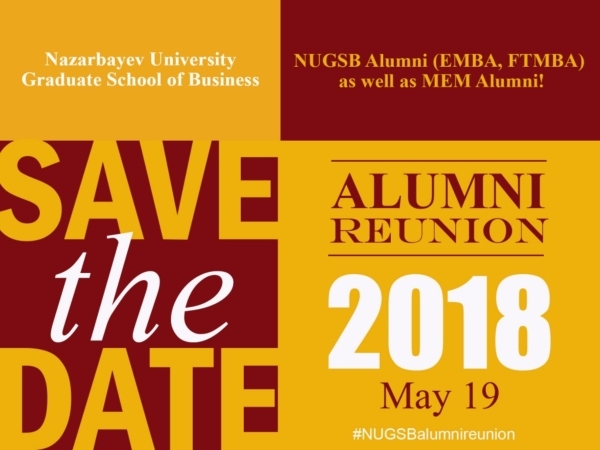 Plan a reunion now, and start sending those invitations.